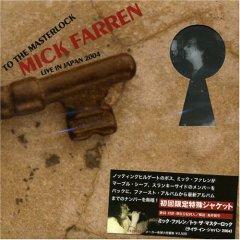 Mick Farren - "To The Masterlock: Live In Japan 2004"
As far as I'm concerned this is a 'real' live Deviants record. So much better than their 'Barbarian Princes-Live In 1999' disc that was released several years back. With twelve tracks to offer the listener there actually are tunes from the first three proper Deviants albums, which include the blues-rocker "I'm Coming Home", "Slum Lord" and "Black Transit Blues". Then, off of Mick Farren's 1978 ' Vampire Stole My Lunch Money' solo effort are "Half Price Drinks" and his cover of Frank Zappa's "Trouble Coming Every Day". Really dug his cover of Lou Reed's "Waiting For My Man" and "Diablo's Cadillac", which is a decent recital. Tracks "Arts Of Darkness" and "Long Walk With The Demon" are short bits of spoken word by Farren, as some might consider him to be like an underground street punk poet. Was very delighted to discover this title to have been put out as such. Best described as proto-type psychedelic UK punk. Line-up: Mick Farren - vocals, Ken Matsutani - guitar, Rie Miyazaki (of Marble Sheep) - bass and Yasuyuk Watanbe - drums. Sound isn't perfect but good enough. A must-have for any and all old time Deviants fans, as I know you're out there. CD comes housed in a special two-way fold out cardboard holder. It's pretty cool. Certainly not one of those ultra-fragile cheesy jobs. If you happen to be a new Deviants fan I would suggest you start with 'Ptooff', then work your way forward.